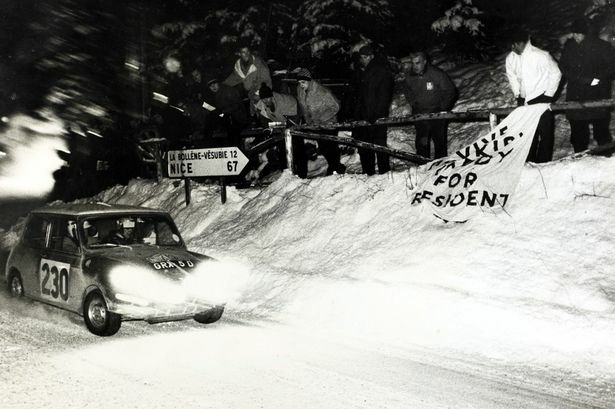 Paddy Hopkirk wins the Monte Carlo in a Mini thanks to the Mirror in a Mini Cooper, seeing off the might and power of the Mercedes, Porsche and Saab teams. Paddy’s historic triumph changed the face of the British car industry for ever, catapulting both him and the little car to worldwide stardom. Just days after the win he drove the car on to the stage of the London Palladium in front of 20 million viewers watching live on television. And it was Strictly Come Dancing host Bruce Forsyth who was there to greet him on stage. “And he’s still on the TV now – 50 years on… fantastic,” laughs Paddy, now 80. “I can’t believe it was 50 years ago now. I remember it so clearly. After winning the rally Paddy and his co-driver Henry Liddon were presented with the winning trophy by Princess Grace of Monaco and her husband Prince Rainier. “It’s difficult to explain to people now just how big it was to win the Monte Carlo rally in those days. “Nobody gave the Mini any chance. It was up against the Mercedes, Porsche, Renault, Citroen and Saab and here was this little Mini – which was originally designed to take midwives and district nurses around Britain. “But we did have a wonderful team of mechanics and we practised really hard. “And it certainly wasn’t like nowadays with all the help the drivers get now like having a first class chef getting the diets right. “We used to have Heinz self-heating soup for example. In the days after the win Paddy became one of the most famous faces in the country. He was interviewed for papers, magazines and made his memorable appearance on stage at the London Palladium. 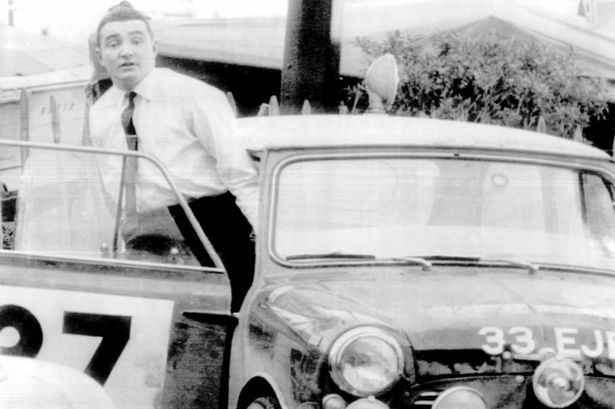 He even had his own cartoon column in the Sunday Mirror called Drive with Paddy Hopkirk. But the highlight was appearing on live TV. Paddy recalled: “After the rally had finished the car was then flown back to Southend Airport. We drove it to the London Palladium and then we drove it on to the stage where we were met by Bruce Forsyth. “It’s amazing to think he is still going strong – fantastic for him. “It was on ITV’s Live at the London Palladium watched by 20 million people – far bigger than X Factor these days. “Bruce asked me what was the hardest part of the journey and I replied – getting the Mini through the stage door here! Paddy has been married to his wife Jenny for 46 years. They have three children Katie, Patrick and William and live near High Wycombe, Bucks. He still recalls fondly details of the rally. He said: “We had to start in Minsk, now in Belarus, which was then in Russia. It was so cold at one stage it was down to minus 39 degrees. “But it was a great adventure. I remember that the BBC sent the legendary TV reporter Raymond Baxter to cover it. It’s difficult to describe how different the rally was in those days though. It was a massive event but there was very little communication. “About 240 cars took part – taking off from several different cities. “And it wasn’t until you got to Monte Carlo that you had any idea of where you were in the rally. In fact I was in Monte Carlo fast asleep in my hotel room when I received a phone call from a French journalist who told me I was in the lead. “There were only five laps of the track to do in the morning so unless I broke down we had won. That’s how I heard. 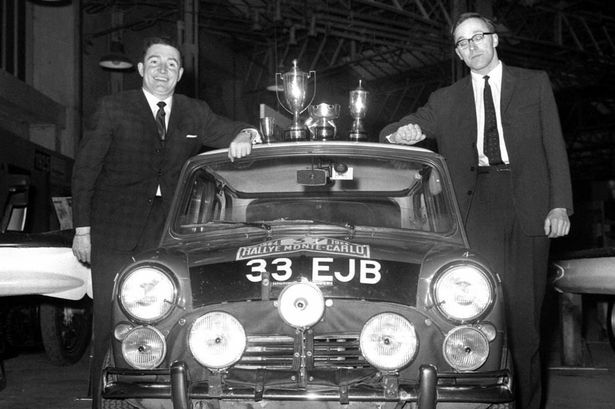 “The other teams couldn’t believe the little old British Mini could win such an important rally. When I received the trophy from Prince Rainier and Princess Grace I was dumbstruck. “I could barely find the words to speak because Princess Grace was such a big star at the time. “I only found the trophy a few years ago. I don’t keep my trophies on display and it was packed away but I couldn’t find the lid. Paddy’s beloved Mini is now a prize exhibit at the British Heritage Motor Centre in Warwickshire, where he was reunited with it last week – both locked together in British motoring history. Nowadays Paddy devotes much of his time to working as a patron of a charity called Skidz. It is a project which helps give disadvantaged and vulnerable youngsters a chance to acquire vocational skills in motor mechanics. The remainder of his time he spends doting on his six grandchildren – Molly, 12, Jessica, 10, Fenella, eight, Amalia, eight, Allegra, five, and Alexander, four. And Paddy’s love affair with the Mini has never waned. It’s still his favourite vehicle. This video will only work as long as the Mirror has it available on their website.